People call all the time and ask many questions about the requirements or how to become a SLED Certified Security Officer. Take some time to review our information and everything will become clear for you. Primary Basic: For SC only or to work in SC. This class is mandatory to become a SLED Certified Security Officer. 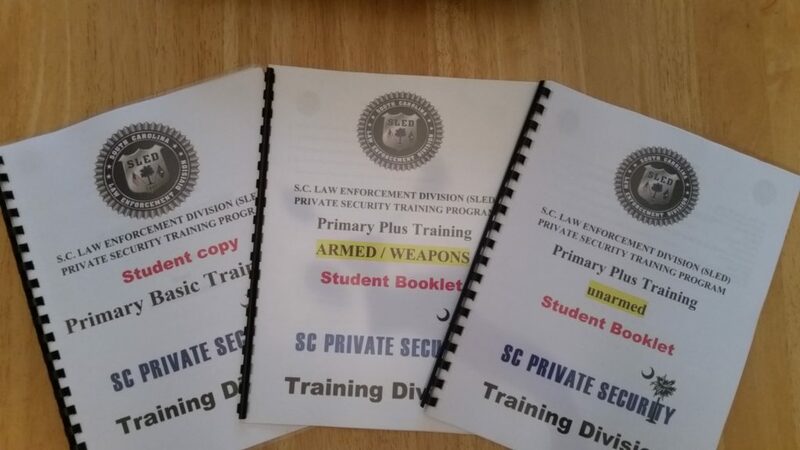 To do any of the other training listed below, in SC, you must have this class 1st. We are licensed through SLED to teach this. Primary Plus: For SC only or to work in SC. This class is optional to become a SLED Certified Security Officer with the authority to arrest and to learn the laws for “use of force”. We are licensed through SLED to teach this. Weapons Training: For SC only or to work in SC. This class is optional to become a ARMED SLED Certified Security Officer with the authority to arrest and to learn the laws for “use of force”. This is an Ad-on to the “Primary Plus Training”. We are licensed through SLED to teach this. CEW / Taser: This class is available for any Certified Security Officer in the US. You must be a Certified Security officer already to be able to take this class. This class is optional to be able to carry a “TASER” while performing your duties. For SC, this is an Ad-on to the “Primary Plus Training”. For other states, we just certify you. We are licensed through TASER to teach this. OC Pepper Spray: This class is available for any Certified Security Officer in the US. You must be a Certified Security officer already to be able to take this class. This class is optional to be able to carry “OC Pepper Spray” while performing your duties. For SC, this is an Ad-on to the “Primary Plus Training”. For other states, we just certify you. We are licensed through Sabre to teach this. CWP: For SC residents. We are approved and Certified through SLED as an instructor. This class is for civilians who want to carry a concealed weapon on them for their safety. Every student gets a professionally assembled binder for the class they want to take. In the binders are added information to help the officer (student) get a better understanding of the class. Are you a “Local” Security company that needs assistance with training some of your officers? If you are an individual, meaning you do not work for a security company at all. Are you a security company from another state that wants their officers certified to work in SC? Are you a security company from another state and just want Taser or OC Pepper Spray training? Click the Taser or OC Pepper Spray links. Are you a “Civilian” looking to get their CWP license? Primary Basic and Primary Plus are explained here. Primary Basic (Mandatory): To basically become a “Mall security guard” or to meet the minimum requirements by SLED. This means no “arrest authority”, no “use of force” training. This is a 4 hour class. The following is a part of the Primary Plus Class. Primary Plus is basically what makes an officer have arrest powers and carry different types of weapons. Weapons Certification: To carry a handgun on your posts.This is part of the Primary Plus Training, if selected. OC Pepper Spray: To carry OC Pepper Spray on your post. This is part of the Primary Plus Training, if selected. CEW (Taser): To carry a Taser on your post. This is part of the Primary Plus Training, if selected. Handcuffing: To have arrest powers this is a must. This is part of the Primary Plus Training, if selected. CWP: Civilian training to carry your weapon legally as a concealed weapons holder. A. You can ask for the Authority to arrest, Use of force and Handcuffing with the Laws and nothing else, no weapons at all. This is the bare minimum for “Primary Plus”. If you take this, it allows you to carry handcuffs and make arrests. B. You can certify in Taser and NOT with a handgun or OC Pepper Spray. C. You can certify in OC Pepper Spray only and NOT do the handgun and Taser. D. You can certify in the handgun only and NOT do the OC Pepper Spray or Taser. E. You can certify in all of the above and become a “Premium” more marketable officer for any agency that is ready to hire. F. With options B, C and D….you will be trained with handcuffing , use of force and some law because there are weapons involved in these options. We can do all your training from our training facility, or we can come to you! We also do training on Saturdays and Sundays!!! !